Gross CC, Ahmetspahic D, Ruck T, Schulte-Mecklenbeck A, Schwarte K, Jörgens S, Scheu S, Windhagen S, Graefe B, Melzer N, Klotz L, Arolt V, Wiendl H, Meuth SG, Alferink J. Alemtuzumab treatment alters circulating innate immune cells in multiple sclerosis. Neurol Neuroimmunol Neuroinflamm. 2016 Oct 12;3(6):e289. OBJECTIVE:To characterize changes in myeloid and lymphoid innate immune cells in patients with relapsing-remitting multiple sclerosis (MS) during a 6-month follow-up after alemtuzumab treatment. METHODS:Circulating innate immune cells including myeloid cells and innate lymphoid cells (ILCs) were analyzed before and 6 and 12 months after onset of alemtuzumab treatment. Furthermore, a potential effect on granulocyte-macrophage colony-stimulating factor (GM-CSF) and interleukin (IL)-23 production by myeloid cells and natural killer (NK) cell cytolytic activity was determined. RESULTS:In comparison to CD4+ T lymphocytes, myeloid and lymphoid innate cell subsets of patients with MS expressed significantly lower amounts of CD52 on their cell surface. Six months after CD52 depletion, numbers of circulating plasmacytoid dendritic cells (DCs) and conventional DCs were reduced compared to baseline. GM-CSF and IL-23 production in DCs remained unchanged. 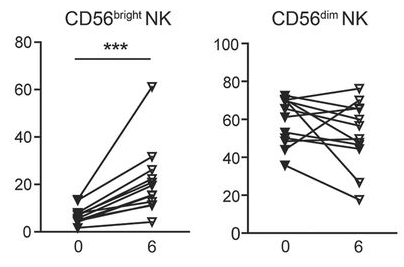 Within the ILC compartment, the subset of CD56bright NK cells specifically expanded under alemtuzumab treatment, but their cytolytic activity did not change. CONCLUSIONS:Our findings demonstrate that 6 months after alemtuzumab treatment, specific DC subsets are reduced, while CD56bright NK cells expanded in patients with MS. Thus, alemtuzumab specifically restricts the DC compartment and expands the CD56bright NK cell subset with potential immunoregulatory properties in MS. We suggest that remodeling of the innate immune compartment may promote long-term efficacy of alemtuzumab and preserve immunocompetence in patients with MS. This study looks at the effect of alemtuzumab on dendritic cells and natural killer cells at baseline and 6 and 12 months after alemtuzumab and finds that alemtuzumab-induced decrease of CD4+ T cells was accompanied by an increase in frequencies of the CD56bright NK cells subset. The authors state “Secondary autoimmune diseases including Hashimoto thyroiditis are common adverse reactions following alemtuzumab therapy. Although the underlying mechanisms of autoimmunity following alemtuzumab therapy have not yet been resolved, one can speculate on the functional implication of CD56bright NK cells in this process”. I suspect it doesn’t have a major impact. It came as a surprise to me that that the leucocyte subset analysis of the effects in the phase III trials were not published in the pivotal data set, or in a paper afterwards. The data just appeared as some meeting reports published in abstracts, but if you know where to look, you can find the data and there was limited effect on CD16, CD56 NK cells. This study is based on a few samples when hundreds were tested in the trials. Maybe it highlights the problems of looking at subsets. Are we subsetted enough? To get the real picutre. As the CD56bright go up, the dim sort of go down. So looking just at positive may miss an effect. However, people on daclizumab appear to get autoimmunity but these tend to be related to skin conditions rather than thyroid autoimmunity and so I suspect have a different origin. After dacliziumab the T regulatory population do down. Is this the problem? For alemtuzumab a cause because of T reg cells has been dismessed and it has been suggested that the autoimmunity after alemtuzumab is occuring because T cells do not repopulate via the thymus. I think there are other ideas too..but thats another story. Mouse Doc expansion of the CD56-bright NK-cell population seems to common to many DMTs, including IFNbeta. Could it be telling us something? Maybe that MS is caused by an infectious agent and these drug work because the the NK cells are dealing with an infection could be the answer, otherwise how do we explain how daclizumab works. Daclizumab is the best example, because it blocks the high affinity intereleukin 2 receptor it allows NK to be expanded by the spare IL-2.